UMR CNRS 7635, Sophia-Antipolis, France. for various medical and pharmaceutical applications. 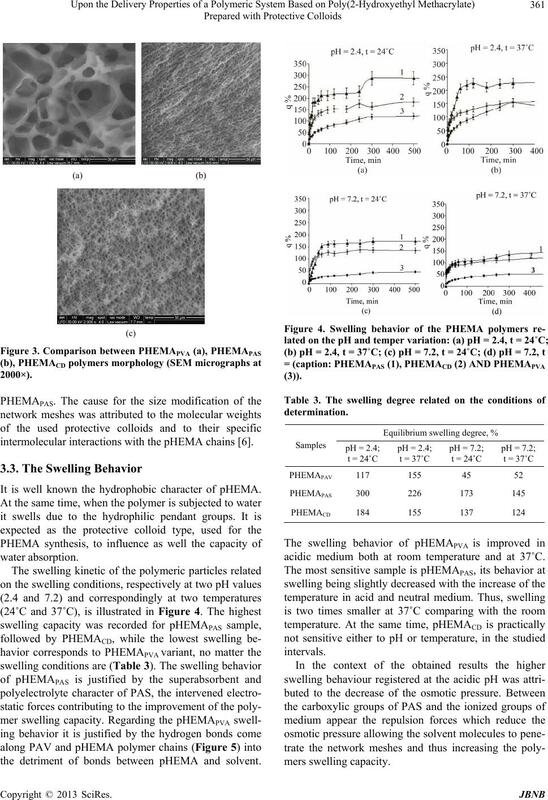 prepare pHEMA in the form of a hydrogel [1,2]. requires a proper choice of initiator and/or surfactant. chain length greater than eight were used . generally the performance of the latex characteristics. 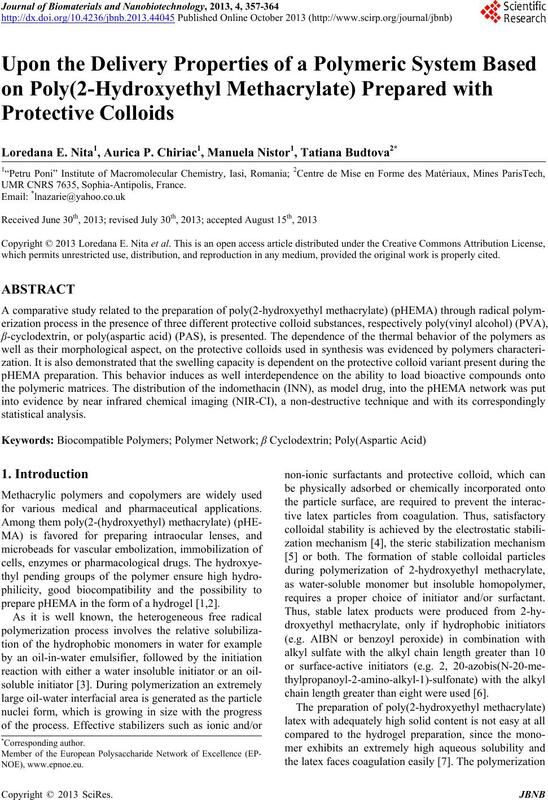 water solubility of the hydrophobic compounds [9-12]. environmental acceptability and waste disposal [13,14]. polymeric network, were also evaluated. merization formulations are presented in Table 1.
by lyophilization for 24 h.
~1270 cm−1 to v (C-O) stretching vibration. ing to recipes from Table 1.
the swelling experiments were performed in triplicate. wavelength range starting from 1100 nm to 2500 nm. with INN were immersed in the phosfate buffer solution. (Perkin Elmer spectrophotometer) at 319 nm. one is not as evident as in case of pHEMACD samples. 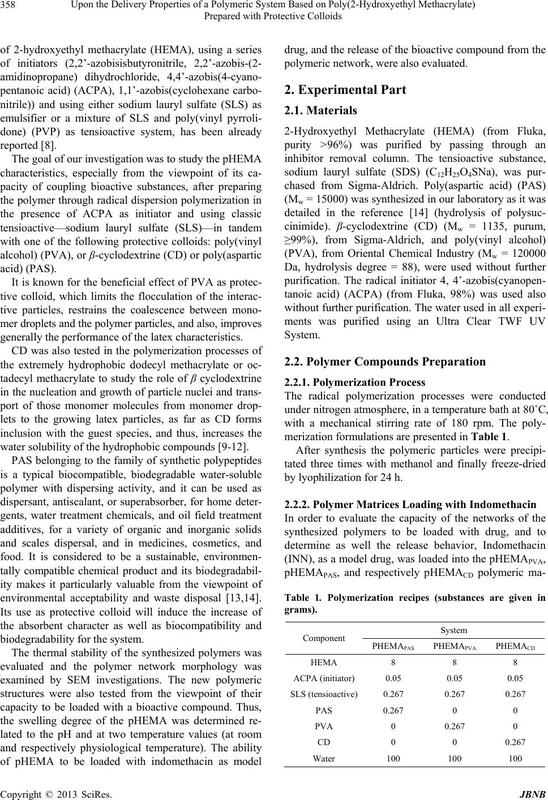 decomposition behaviour of the synthesized polyme r s.
Table 2. Thermal characteristic s of the synthesized samples. position process; ΔW: Total weight loss percentage at the end steps. fibers (pHEMAPAS) or lacing nanofibers (pHEMACD). 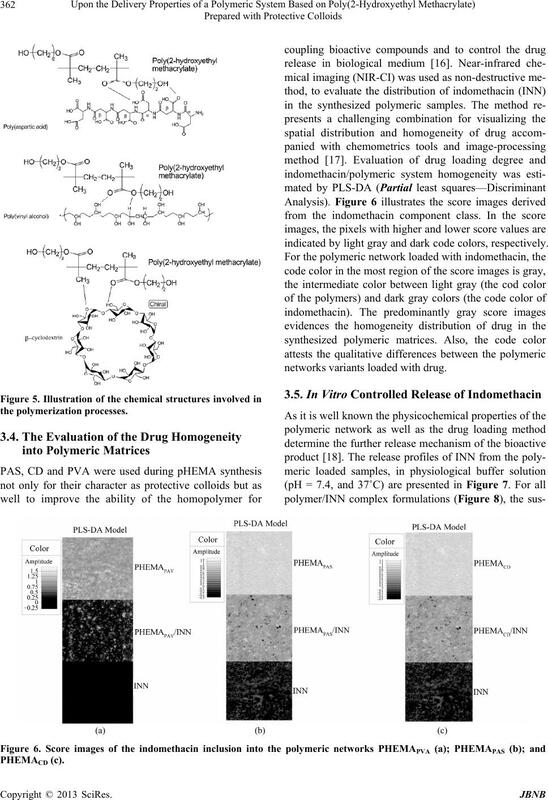 intermolecular interactions with the pHEMA chains . 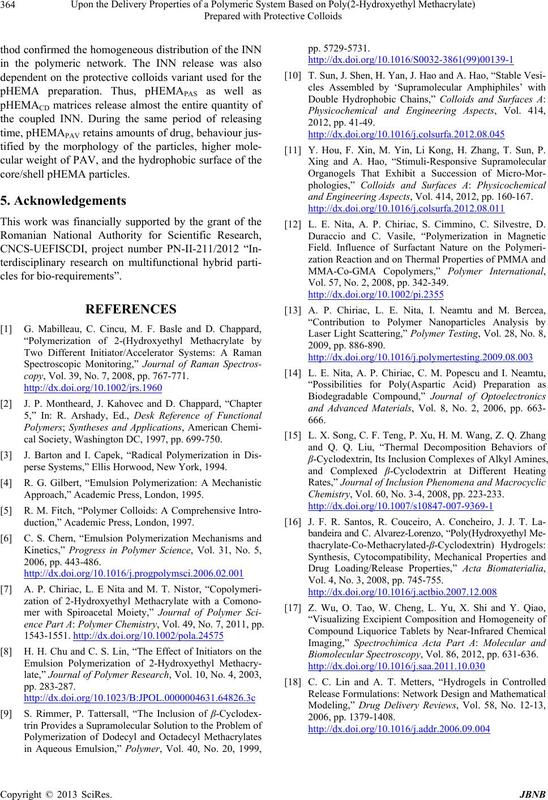 It is well known the hydrophobic character of pHEMA. 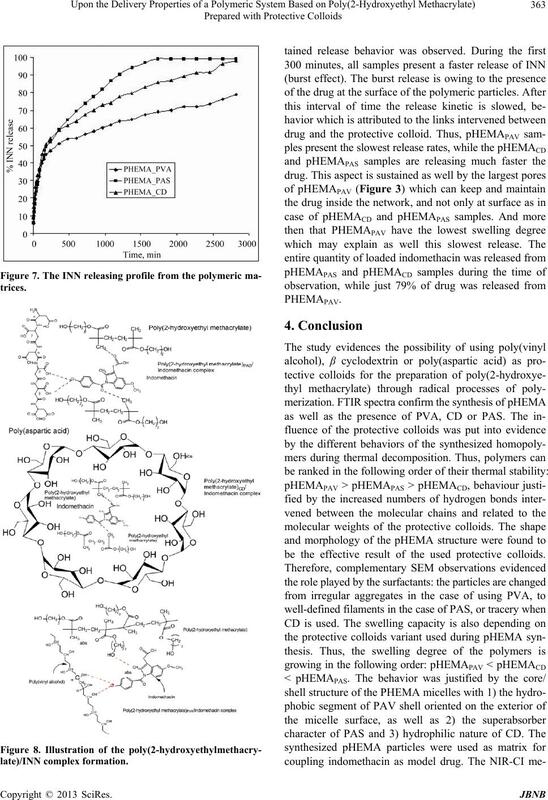 the detriment of bonds between pHEMA and solvent. acidic medium both at room temperature and at 37˚C. indicated by light gray and dark code colors, respectively. networks variants loaded with drug. be the effective result of the used protective colloids. copy, Vol. 39, No. 7, 2008, pp. 767-771.
cal Society, Washington DC, 1997, pp. 699-750.
perse Systems,” Ellis Horwood, New York, 1994. 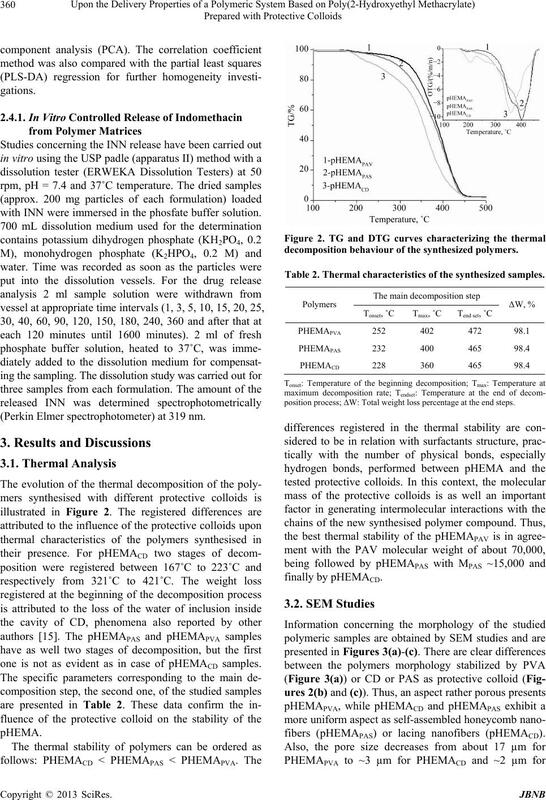 Approach,” Academic Press, London, 1995.
duction,” Academic Press, London, 1997.
ence Part A: Polymer Chemistry, Vol. 49, No. 7, 2011, pp. Y. Hou, F. Xin, M. Yin, Li Kong, H. Zhang, T. Sun, P.
and Engineering Aspects, Vol. 414, 2012, pp. 160-167. L. E. Nita, A. P. Chiriac, S. Cimmino, C. Silvestre, D.
Vol. 57, No. 2, 2008, pp. 342-349. Chemistry, Vol. 60, No. 3-4, 2008, pp. 223-233. Vol. 4, No. 3, 2008, pp. 745-755. 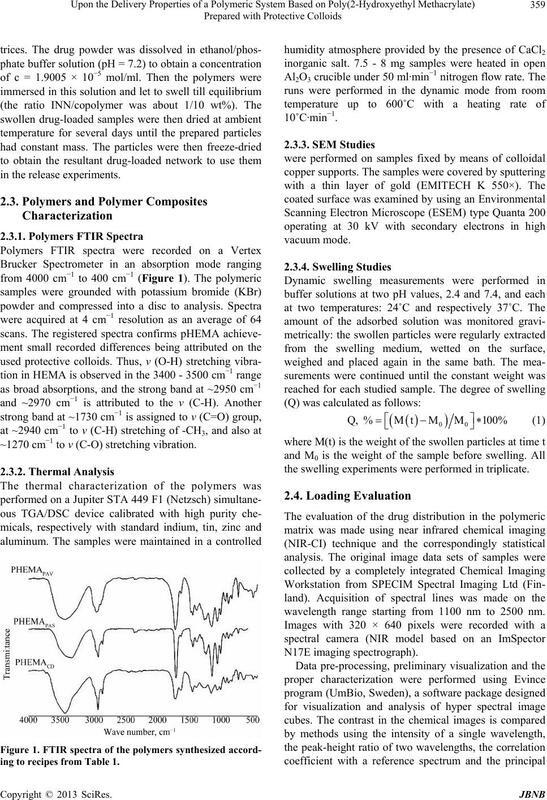 Biomolecular Spectroscopy, Vol. 86, 2012, pp. 631-636.